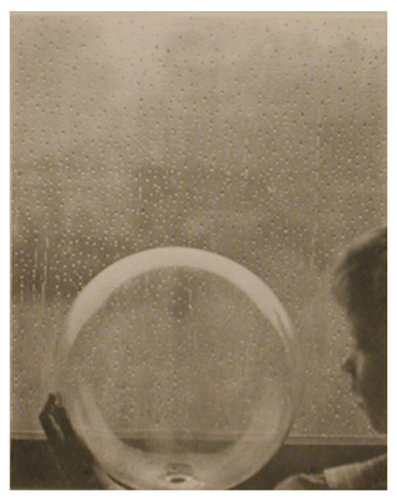 Clarence H. White, Drops of Rain, photogravure, 1908. I stare out at bare window pane above and netted screen below. Drops of rain move across, smooth, quick, lithe on the glass and awkward, meandering, stilted across the finely textured squares of mesh. Windows as release, as way out and through, but my depth of field is shallow, my view shortsighted. In fall, the western light floods in and dances on the bedroom wall, dappled evening light with shadows of the garden’s lattice and leaves playing across the cracks and divots of ivory-painted texture. Today’s light is flat and grey, the late afternoon light of late winter. In it, I had expected raindrops with the symmetry of snowflakes, the perfect circles of ripples from a drop in quiet water, like Giotto demonstrating his skill on the smooth paper of still pond. Instead, they’re squat or tall, with dark tops and beautiful, rounded, curving, light bottoms. The rain sounds steady, regular, muted through the double panes, until a gust hits and makes the screen vibrate and the drops quake, resettle, fall. I think of the crow who often lands, mornings, with graceful thud, on the dormer above. I wish I could know his face as I’m made to understand that he might, out of cunning and habit, know mine.